The meadow saffron, or autumn crocus, as it is also called, is a highly fascinating plant. Its purple flowers look like crocuses, but appear in early autumn, when most other plants are done flowering. This is also reflected in its German name “Herbstzeitlose”, which means “autumn messenger”. From the “naked” flowers may also be derived the English moniker “naked ladies”. The leaves, on the other hand, show up in spring and have been mistaken for bear’s garlic. A dangerous and potentially deadly mistake, since the entire plant contains the alkaloid colchicine, which acts similar to arsenic, and has no known antidote. In addition it has a long latency period, which makes poisoning with autumn crocus even more difficult to recognize and treat. Colchicine acts as a mitotic poison, by interfering with the reduction division of the chromosomes during meiosis. While deadly, it is also made use of in medicine, for treating certain types of cancer, as well as in plant breeding, where it causes plants to grow larger and produce bigger fruits. A plant named Colchicon was first mentioned by Dioscorides. The specific name autumnale given by Linnaeus, refers to its time of flowering. The genus name Colchicum is derived from Colchis, the landscape on the Black Sea, most famously known for the witch Medea, who is told to have poisoned her enemies with meadow saffron, but also restored youth with its help. In Apollonius Rhodius’ Argonautica, Medea rubs a salve on Jason’s limbs, which contains meadow saffron. According to another legend, meadow saffron grew from the blood that dripped from Prometheus’ liver. However, the same story is also related to the Mandrake and both plants are candidates for the mythical plant named “blood of Prometheus”. Despite a narrow therapeutic index, meadow saffron has been used medicinally for at least 3500 years. It is still a treatment for rheumatism and gout. During the times of the plague the bulb was also worn as a protective amulet around the neck. (You can read more about this plant on my garden blog). 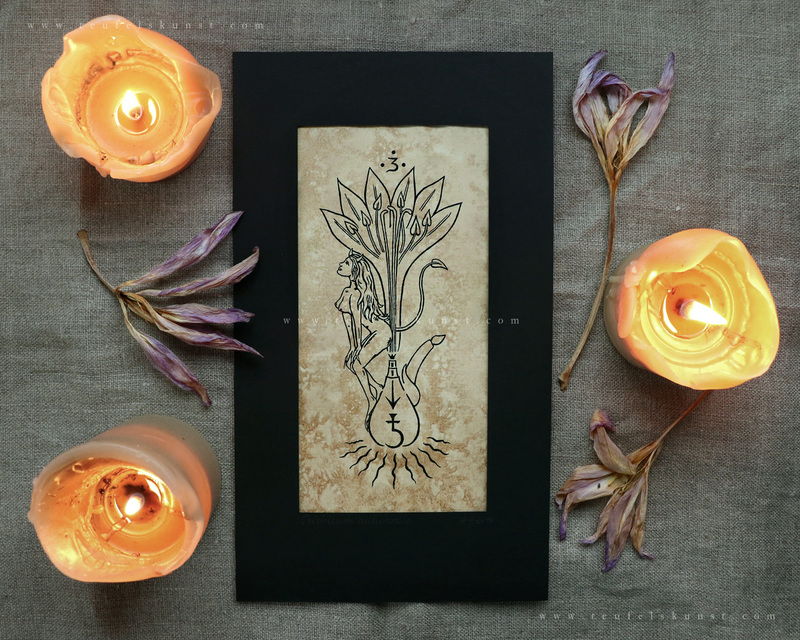 The artwork shown here is one of my more illustrative works, combining symbolism and showing the plant spirit in an anthropomorphic form. It was first show-cased in 2017 at gallery Circle1 in Berlin, as part of the “Bad Intentions” group exhibition. It is drawn with black ink on paper that has been stained with coffee and meadow saffron flower extract. It is signed and dated on the back and comes in a simple black cardboard passe-partout. You receive the exact work shown here. For ordering please go here.